So you want to be a magician? Congratulations; you are about to embark on what could be a life long hobby, vocation, or even career filled with wonder and satisfaction. Not everyone is cut out to be David Copperfield, Lance Burton or David Blane - and that is perfectly alright. 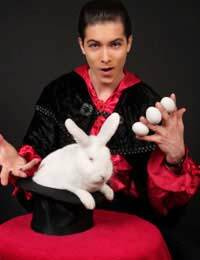 There are magicians of all types - street performers, stage magicians, career magicians, birthday clowns and that uncle we all seem to have that knows a handful of card tricks and can pull coins out of our ears when we are young. You don’t have to decide what kind of magician you are going to be right now - try it out first. Learn a few tricks, follow the rules, do a few “performances” (in front of one person or a hundred, any magic done with an audience is a performance) and see how you like it. Even if you are just interested in trying one or two tricks, or want to have a small set of party tricks to entertain a few friends, or are just curious to learn how the magic works, you must follow the rules. There are plenty of them, but the most basic are designed to not only protect a magician’s livelihood by keeping the tricks secret but also to protect the magician him or herself (that’s you!) when performing. If you don’t follow the rules you are likely to end up making mistakes during a trick and revealing the secret - then what started out as great way to amaze someone, leaves you and them feeling cheated and certainly less than amazed. So this is a casual effort on your part, just to see if you would like it? Then follow the rules and if you decided they are not worth the effort to follow, then you have your answer - magic is not for you. At some point you will need to decide where you want to go with your magic journey. How seriously do you want to take this hobby? Do you want to be pretty good, able to find anyone’s playing card or make coins appear or do you want to be GREAT - blowing the minds of your audience every time you perform, making it look effortless and magical? The level of your ability is in direct proportion to the level of your effort - the more you practice, the better you get. Can you still perform magic and not practice hours and hours a day? Absolutely, should you decide magic is going to be a smaller part of your life than if you wanted to emulate David Blane and get your own TV special. There is nothing wrong with whatever decision you make about how involved you will be in magic - it is YOUR decision to make and you can certainly change it from time to time - but you will have to deicide at some point. This site is set up with basic divisions of magic categories - Card Magic, Coin Magic, Quick Tricks, Pub Magic and Stage Magic. Card and Coin Magic are self explanatory and Quick Tricks are just that - magic tricks that are quick and easy and can be done just about anywhere. Pub Magic is similar to Quick Tricks but offers something more to that audience - typically a challenge or using objects found in a Pub. Stage Magic contains effects that work great when putting on a Show as opposed to pulling out a deck of cards at school and showing someone a trick or two. One last thought - as you will find when you read the Rules on magic, you might find a discrepancy. One of the rules is “Never reveal the Secret” to a trick, yet here on the site you will find scores of magic secrets revealed. Well, the full rule is “Never reveal the Secret - except to a fellow magician who is willing to learn and follow the rules.” If you are here and reading this, it just has to be assumed that you fit in this category. Just as the author of a magic book has no control over whether or not the reader of the book will follow the rules or is out to “ruin the fun” for magicians, we can’t control that either. Many of the tricks here can be found elsewhere on the Internet, but are not treated with the same care and devotion as these are. We are not about exposing magic secrets for the sake of exposing magic secrets, but rather providing quality instruction to those who really want to learn. That's fabulous, we hope our website helps you. This is a very cool site. contains good magics.it would be better to increase the number of magics.